Facebook Live is accessible to 1.66 million users today, and a variety of businesses have adopted it as a tool to engage with their followers. Brands that live broadcast product launches, behind-the-scene event footage, and demos over Facebook increase their social-media-standing dramatically. One reason for increased engagement is that Facebook Live instantly notifies followers when the broadcast begins and a red “Live” logo is added to any live streaming videos. 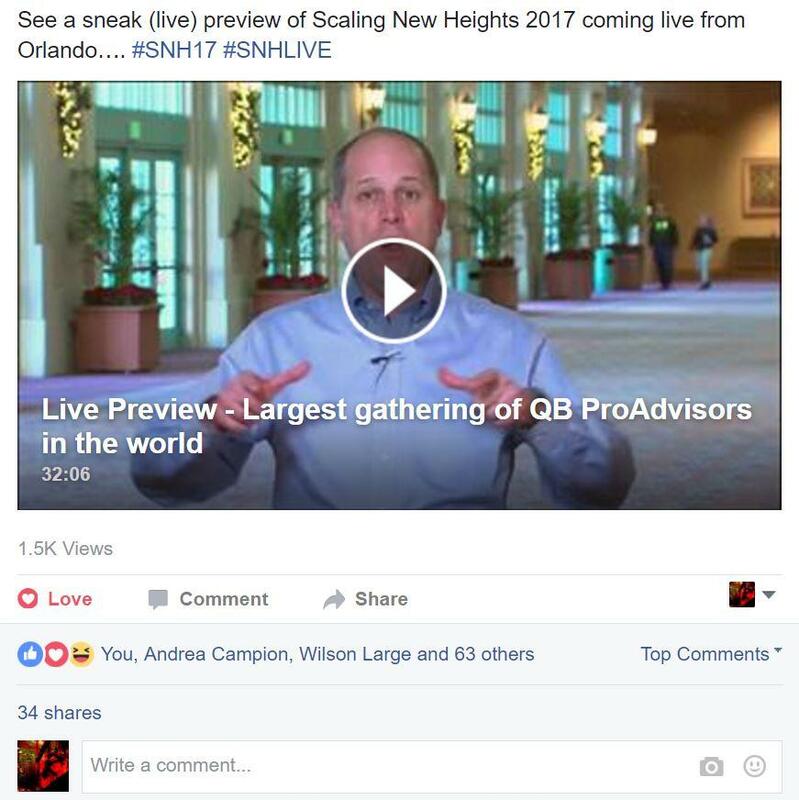 Early last December, we helped our client, Scaling New Heights, promote their June conference by producing a live stream to their Facebook page. The SNH staff was visiting their venue (Disney’s Coronado Springs Resort in Orlando, Florida) to do a walk through and plan their event, and the live stream offered their audience a preview of the venue and gave them an opportunity for a real-time Q&A session. Although Scaling New Heights started with nearly 40 real-time viewers, they gathered 1.4k views after airing their Facebook Live conference promotion broadcast, as all Facebook Live videos are recorded and available on demand after a broadcast. To add an element exclusivity, SNH offered their online audience code words for discounted rooms and flights as a way to encourage attendance. According to social media leaders, like those at SSW16, digital marketing is key to develop brand identity and trust. Online brand identity is created in a variety of ways -through blog posts and tweets, for example- and each social output reaps specialized benefits. In order to be successful, a business ought to use a wide array of social engagement tools, including live streaming which is growing in popularity. With the largest social network on the internet, Facebook Live makes it easier than ever to engage with target audiences online. Want to learn more about the perks of Facebook live and key steps to starting your live stream? Take a look at our Facebook Live page, here. Rob Read, Business Development Manager at Roland Professional AV, often comes to the Varvid headquarters to demo new products. Recently, we filmed Rob’s demo of Roland’s V-1SDI to share with you all! The V-1SDI video switcher is flexible,versatile, and portable. Connecting and switching 3G-SDI cameras, playback sources, and HDMI sources (cameras, smartphones, computers, tablets, Blu-ray players) is made easy with the T-Fader and backlit buttons. The results are, certainly, nothing short of professional. With support for 3G-SDI, the V-1SDI can operate at full 1080p resolution and can take advantage of the longer cable distance of SDI making this compact solution suitable for events and applications in even large spaces with the most professional level of SDI camera sources. Support for SDI and HDMI cameras, smartphones, tablet computers and PCs etc. Technology’s Future, Webcasting and Varvid – It’s Friday, I’m in Love! Webcasting — it’s one of the first services Varvid initially offered and it continues to be a cornerstone to our overall success. While most of our projects have us traveling to wonderful locations across the globe, we are pleased to be planning, preparing and testing for one right here our own backyard. On Friday, January 18th, we’ll produce and live stream Technology Alliance Group Northwest’s (TAGNW) Annual Predictions Luncheon from Syre Hall on the campus of Whatcom Community College. Living in Bellingham is wonderful and working in Bellingham is even better! We are honored to be part of what we expect to be a long running tradition. The event and webcast gets underway around 11:45am with some formal introductions and organizational announcements. Once the formalities are out of the way, the program moves right into tech-savvy prognosticator Mark Anderson’s predictions and some Q&A until about 1:30 or so. After a little research, his ability to forecast the IT future is pretty darn good… he’s been right more than 90% of the time over the last 10 years! You can participate via our live chat feature. So if you have questions, we’ll ask them on your behalf. This is a great way to save on travel costs and time away from the office. If you are not in Bellingham but would like to attend, no problem. We’ll be broadcasting in H.264. So, it’ll work on your mobile device. https://varvid.com/wp-content/uploads/2015/11/logo-light.png 0 0 aaron https://varvid.com/wp-content/uploads/2015/11/logo-light.png aaron2013-01-17 13:43:122013-01-17 13:43:12Technology’s Future, Webcasting and Varvid – It’s Friday, I’m in Love!